A combination of photos from the scene of an accident which occurred on in Onitsha, Anambra State on March 13, 2019. Photo: [email protected]_Traffic. Upper Iweka in Onitsha, a major commercial hub in Nigeria’s South East region, is popular for a number of reasons, particularly the volume of business activities that takes place there. It is also a major transport hub, with high traffic of persons and vehicles, and connecting virtually every part of the country. Added to this is the swarm of hawkers and petty traders, selling all kinds of consumables, from snacks to water packed in sachets, which make the hustle and bustle nature of Upper Iweka clearly evident. All this was suddenly interrupted at sunset in Onitsha on Wednesday, March 13, when a tanker laden with kerosene lost control and rammed into the crowd of traders and everything in its path, crushing both goods and human beings. Those who could run, fled in different directions. By the time all became quiet, about 10 people were found to have been killed, leaving at least six others critically injured, including a woman who had her left lower limb cut. When Channels Television visited Toronto Hospital, where both the survivors and the dead were moved to after the accident, pain and anguish pervaded the atmosphere. The relatives of the deceased victims were seen wailing, some of them rolling on the floor. For John Anyanwu, who lost a brother in the tragic incident, the death was one too many. “I was home last night (Wednesday) and around 8pm, my sister and my other siblings came to my house and I enquired what the problem was. They said they had called my line but it did not go through and that our younger brother, Chukwunonso Anyanwu, was among those crushed by a tanker at Upper Iweka,” he said. Shocked by the account and thinking it was a joke, Mr Anyanwu demanded to know if it was indeed true. The answer he got left him in demoralised. He said his dead 35-year-old brother was into wine business at the Relief Market in Onitsha. “This young man that died now is just the taproot of the family, not because he was rich more than others but he was a graduate. Whenever we have problem in the family he will stand firm and rally support for the family immediately and that is why his death is very painful to everybody,” he lamented. Miriam Monday, a lady who hawked herbal drinks at Upper Iweka, could not hold back tears as she grieved for her customers who lost their lives in the accident. “I’m crying because of my customers who had accident. The ones I know are five in number that died. The one that I know his name is Experience, that guy, he was selling shoes,” she said as she sobbed. The State Commissioner for Health, Dr Joe Akabuike, who visited the hospital at the instance of the governor was conducted round the wards to sympathise with the injured as he gave the assurance that the government would take up their medical bills. One of the medical personnel attending to the victims, Dr Fredrick Aduba, told the Commissioner that out of the 17 people brought to the hospital, eight were dead on arrival, while two died later. The tragedies on the roads have become worrisome to the state government but the Commissioner for Health promised that the state government would take proactive measures to effectively tackle the challenge of reckless driving that leads to fatal accidents. For some of the witnesses, all parks around Upper Iweka should be moved further inward and leave space for vehicles to move freely on the road, while hawkers and traders on the roadside should be relocated. 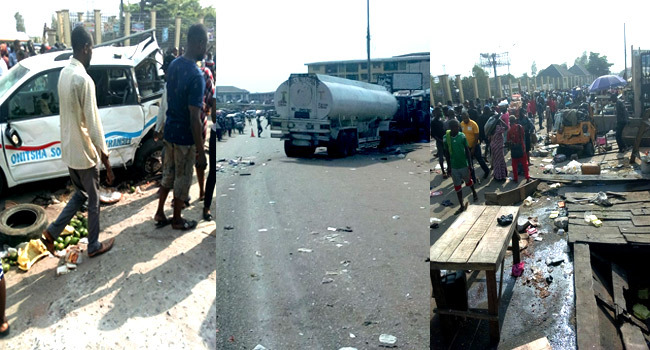 While the residents, especially the eyewitnesses of the Onitsha accident, struggled to come to terms with the tragedy, a similar scenario played out in Umuchu, a town in Aguata Local Government Area of Anambra State, where a trailer laden with cement collided with a tipper and crashed into a chain of stores at Eke Umuchu market. Three people including the driver of the trailer, the conductor of the tipper and a member of the community, who was in front of his shop when the disaster struck, lost their lives.